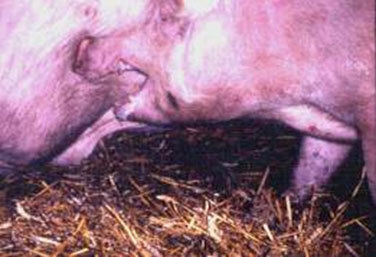 The largest single challenge of keeping sows in groups is that of inter-sow aggression. We know that sows will fight when mixed and when having to compete for access to resources. However, there is little information on the sequence of detailed behaviors that are performed by adult sows when mixed, that either result in a fight or a decision not to fight. We also do not know to what extent the sequence of aggressive behaviors can be changed, and hence fighting reduced, by pre-exposing groups of sows to each other prior to mixing. Firstly, we have investigated, in detail, the aggressive behavior of 64 pregnant sows when mixed to form pairs in situations where space is limited (i.e. - indoor, slatted pen system - one sow mixed with one sow - 16 pairs) - and where space is "limitless" (i.e. 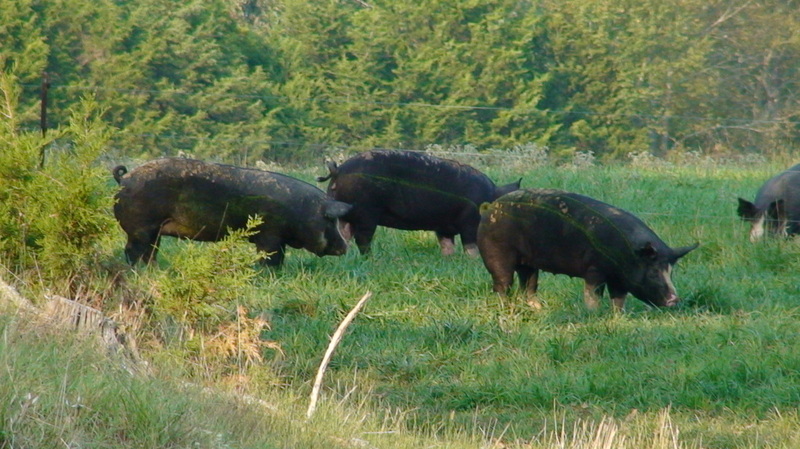 - outdoor, paddock-based system at Newman Farm - one sow mixed with one sow - 16 pairs). Secondly, we have also investigated, in detail, the aggressive behavior of 96 pregnant sows when mixed to form groups of 6 in situations where space is limited (i.e. - indoor, slatted pen system - 3 sows mixed with 3 sows - 8 groups) and where space is "limitless" (i.e. - outdoor, paddock-based system - 3 sows mixed with 3 sows - 8 groups). For both these studies, the data is being entered into a custom-written database for further processing and analysis. The database will then read through each sequence, performing the thousands of iterations and calculations required to perform a Markov analysis. The database will then read through each sequence, performing the thousands of iterations and calculations required to perform a Markov analysis. This will statistically distinguish meaningful patterns of behavior from randomly occurring behavioral transitions. The pattern of association between subsequences and following acts can then be compared between individuals or between treatments using repeated measures GLM. The results will help us to understand which types of behavior might function best to allow the sows to acquire information to prevent interaction escalation. For our third NPB-funded experiment, we looked at the effects of pre-exposure on aggression at mixing and this was carried out in collaboration with Whiteshire Hamroc LLC. As producers move towards group housing in the U.S., many will continue to house sows in crates around breeding, before forming the group after pregnancy checking. Often, sows are randomly allocated into service crates at weaning with selection for subsequent groups made post-mating based on size and body condition. Thus, sows forming the group can be drawn from any crate in the row. Our study investigated the effects of pre-selection on subsequent aggression when the group was formed. We put sows that became the group into neighboring crates, thereby allowing them to establish some degree of social relationship prior to mixing. All three of these studies are being carried out in collaboration with Dr. Joe Garner (Stanford) and Dr. Anna Johnson (Iowa State). We will also begin investigating the neighbor effect in more detail and follow up some previous work looking at the effects of increasing tryptophan and looking at other dietary manipulations to influence aggression at mixing. Poletto, R., Meisel, R.L., Richert, B.T., Cheng, H.W. and Marchant-Forde, J.N. (2010) Aggression in replacement grower and finisher gilts fed a short-term high-tryptophan diet and the effect of long-term human-animal interaction. Applied Animal Behaviour Science, 122: 98-110.